I am always excited about how the Monaco biscuit toppings look in the advertisement and always wanted to try it. When I was looking for quick starter option for my son's party, I chose to make those Biscuit Canopies. And trust me those really rocked! Kids and grown ups all likes this little bites loaded with veggies and cheese! 1, Heat oil in pan and add corn kernels, green peas, carrot and saute for few mins till all veggies are slightly cooked. Do not over cook and maintain the crunch. Repeat for all the canopies. 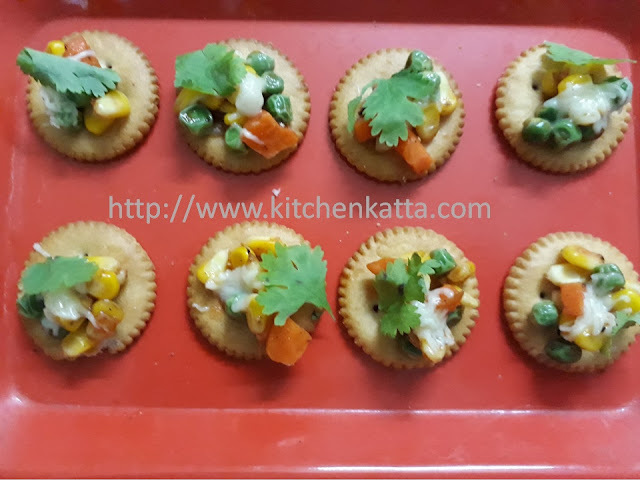 Enjoy your biscuit canopies as starters or as tea time snack!